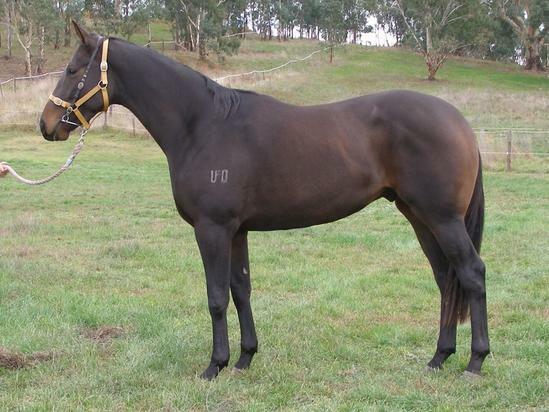 REBEL RAIDER (AUS) (Brown 2005-Stud 2011). 6 wins-2 at 2-from 1200m to 2500m, $A1,408,340, Victoria Derby, Gr.1, South Australian Derby, Gr.1, SAJC Sires' Produce S., Gr.3, Spring S., Gr.3, Chairman's S., L, AV Jennings 2YO H., 3d SAJC Penny Edition S., L, Geelong Classic, L, 4th SAJC Spring S., Gr3. Half-brother to SW Shamoline Warrior (MRC Norman Robinson S., Gr.3). Sire of Prince Tarkeida, Fearless Raider and of the placegetters Ace Attack, Waging War, Wasabi Bob, etc. LANGUID, by Commands. 2 wins at 1400m, 1450m, MRC Slickpix H., 3d STC Freeway Hotel Artarmon 2YO H. Sister to MODERATE. This is her third foal. Dam of one foal to race. MODERATE (Commands). 4 wins-1 at 2-to 1400m, A$191,580, VRC Lexus Hybrid P., L, ATC TAB Ipad App 2YO H., Become an ATC Sponsor H., Australian Turf Club H.
Steep. 10 wins-2 at 2-to 1450m, A$185,920, to 2015-16, VRC Murray Cox 2YO H., MRC Mitavite Challenge Heat 6 H., 3d Ballarat TC Porter Plant Cup. Cascade. 3 wins-1 at 2-at 1000m, 1200m, MVRC Functions & Events 2YO H., 3d MVRC Mee's Buses 2YO H., MRC Chiquita 2YO P., Hawkesbury RC Windsor RSL 2YO H.
Languid. 2 wins. See above. Still Around. Placed in Aust. Gradual (Strategic). 4 wins. See above. Tuareg. 5 wins from 1550m to 1800m, A$252,460, AJC Bass Hill Welter H., VRC Poitrel H., MRC Shrine of Remembrance 70th Anniversay H., STC Freshworld Welter H., Peter Howarth P., 2d VRC Comedy King H., Henry Buck's P., MRC Boulevard H., VRC Jayco H., 3d VRC Tauto Welter H., MRC Amounis H., STC Sydney Morning Herald Welter H., 4th MRC Victoria Gold Cup, L, Barton S., L.
Smarty - Smart Express (Mal.). 3 wins at 1200m, 1400m in Aust. and Malaysia, STC Fastway Couriers H., 2d STC Burwood RSL Award Winning Club H., 3d AJC International Taste of Summer H., MVRC 1011 TTFM 2YO H.
Bam. 7 wins from 1200m to 1800m in Aust. Action Sailor. 24 wins-3 at 2-from 1200m to 1800m to 2016 in Philippines. Chinoi. 13 wins from 1000m to 1600m to 2015 in Philippines. Coreles Dorado. 7 wins from 2000m to 3350m, 125,774,000¥, to 2016, Kyoto Shugakuin S., Kitano Tokubetsu, 2d Hanshin Senriyama Tokubetsu, 3d Hanshin Awaji Tokubetsu, Kyoto Kasuga Tokubetsu. Bambola. 12 wins. See above. King Fuji. 2 wins at 1000m, 1200m, AJC San Miguel H., 2d STC Rosemount Estate H., 3d AJC Inglis H.
What a Formula. Winner at 2000m, SAJC Gay Icarus H.